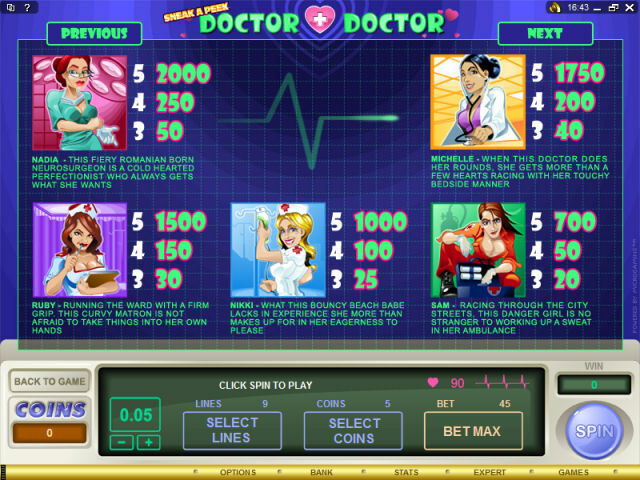 Set in a busy hospital, Doctor Doctor is an adrenalin fuelled 5-Reel, 9-Payline, Multi-Coin Video Slot and, with a medicine bag full of unique features including; a Wild and Scatter Symbol PLUS 2 great NEW features � the innovative Sneak a Peek Bonus Game and a cumulative Free Spins + Multiplier Bonus, its sure to set pulses racing. A beating Red Heart is the Wild and can be used to complete prize-winning combinations across the reels. In addition, a red lipstick kiss or 'Smooch' is the Scatter and will activate the on-screen Bonus Game when it appears across reels 1, 2 and 3 on an active payline. Once in the Bonus Game you must 'Select a Smooch' in order to trigger the innovative Free Spins + Multiplier Bonus Feature. Remember, there is no limit to the number of Free Spins that can be awarded and 2 special capsules on reels 4 and 5 will further increase your play. The yellow capsule relates to Free Spins and the blue capsule to a Multiplier. Finally, when a Sneak a Peek symbol unzips on reel 1 the corresponding position on reel 5 is instantly reserved in the hope that any one of the 5 medicine maids will appear there � thus activating the Sneak a Peek Bonus Game. Each medicine maid has her own bonus screen, from where you must scratch 12 squares from a possible 15 and Sneak a Peek! Remember, the more you reveal, the higher your reward! With a coin bet range of 0.01 to 0.25 and up to 10 coins per payline, a maximum bet of 22.50 can achieve a prescribed Jackpot of 10,000 plus, an additional 100,000 via Free Spins and 1,350 via the Bonus Game. Just a spoonful of Doctor Doctor is sure to make the medicine go down and your winnings go up!